Olympic Curling In The School Gym? 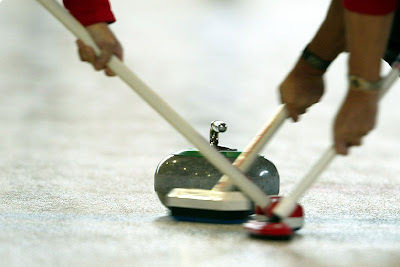 You can imagine my surprise when my eight-year-old son came home and told me his team at school had won the gold medal for curling in his P.E. class. Curling in school? Yes, he had! His clever P.E. teacher created a school version of curling. The children used hockey sticks, bean bags, and targets and they had a blast curling all over their gym. So what do I know, I am hoping my eight-year-old takes to school curling. I have told him that he can practice at home whenever he wants. I will get out my mop or broom and he can practice his curling technique all over my kitchen floor! 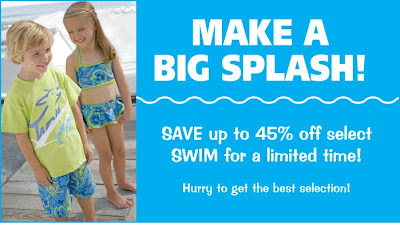 Be the first to shop our Pre-Season Swim Sale! Hurry to get the best selection, this sale is for a limited time only! Start shopping now. Stayin' Alive in the 1700's? February 22 was George Washington’s birthday. In his honor, my eleven-year-old daughter completed a history project on George Washington this weekend. Her assignment was to put together a video interview of George Washington (played by herself). She worked all day Saturday coming up with questions that she would like to ask “George”, as well as making her costume. She collected her brother’s baseball pants and blue blazer. She created her powdered wig using a winter hat and cotton balls. She really looked great. Sunday afternoon, she ran over to her friend’s house to film the interview. She thought her friend could “do a better job” than I would as the interviewer. (I really was not offended to be left out of the project.) Four hours later, she returned home and proudly showed me her video. She and her friend had drawn an American flag and decorated their interview set. It all looked perfect. I could not wait to see what she had created. My daughter told me that she and her friend had decided to start the video with music as an introduction. Oh, I thought what a great idea to use music until I heard the tune… It was not a Colonial fife and drum tune or a nice instrumental. Somehow, these girls had selected Stayin' Alive by the Bee Gees!? I really have no idea where the idea to bring the Bee Gees to the late 1700’s came from. I truly think the Bee Gees need to stay in the 1980’s and should not be brought to the past or the present. I sat and watched their whole interview trembling with fear that John Travolta was going to jump out from backstage to conclude the production. I cannot wait to hear about their teacher's reaction! 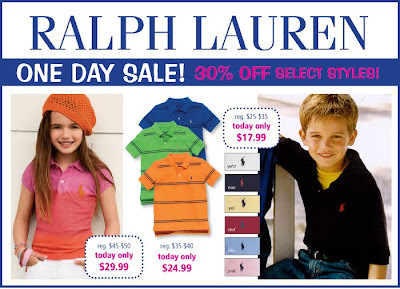 TODAY ONLY - Save 30% on select Polo Ralph Lauren! Start Shopping Now! History sure has repeated itself with the come-back of the Tie-Dye and Peace sign and trends! It's no wonder kids love tie-dye, the bright colors and swirl patterns are so much fun and reminiscent of summer! Shop our selection of tie-dye and dip-dye garments and let you kids make a far-out statement! Start shopping for spring NOW while the best selection is still in stock! Click here to view select spring items on sale for a Limited Time Only! Kara: I loved this article about long distance grandparenting. I can relate because I have a 7 month old and my parents live about 7 hours away. We "skype" whenever we can, and it's the next best thing to them being right there. They can bond with our daughter by talking, singing, or reading to her! Even though she's only 7 months, she's learning who they are and recognizes their faces. It's a God send! Ashley: With two boys, Shaun White and snowboarding have been really popular at my house this week! They love watching the snowboarding events, not to mention the USA team uniforms! In case you missed it, watch this clip of the Today Show interview Shaun White as he talks about winning the Gold Medal. Tracy: I really like this short story on Today Moms blog. Just being the best mom she could be and showing her daughter the importance of trying new challenges, it is the mom who discovers her "gold medal triumph"! Three Days Only Save 10% on select Anita G styles! We love Anita G's casual yet pretty styles, comfortable fabrics and fun colors. Her styles are easy to wear and perfect for everyday. Hurry, offer expires 11:59pm EST 2/21/10! Of course, he drew the name of a dreaded girl and each day he struggled with what words to use on his notes. He did not want to give the wrong impression. (I am not sure what impression an eight year old can give??) One particular day, he really belabored his word choice on his card. My curiosity was peaked and I just had to look in to his bag to see what he wrote. It said, and I am not joking, “I like your shoes.” At least, he attached a bag of cookies to his note. 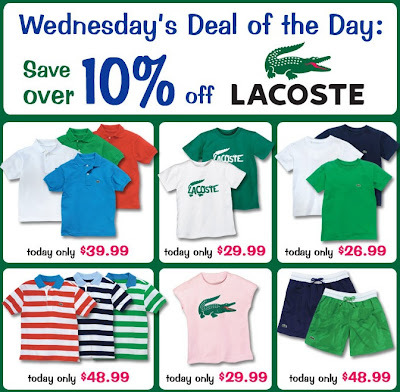 TODAY ONLY - Save on select Lacoste! Hurry, prices will return to regular price at 11:59pm EST 2/17/10. We love this customer photo posted on our Facebook Fan page! 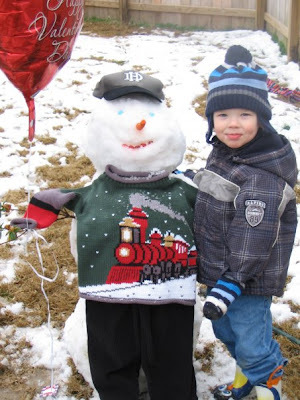 Even snowmen look adorable in clothing from CWDkids! Check out frosty sporting his train sweater! Unsure of the Easter Weather? Easter is April 4th, so who knows what the temperature will be! 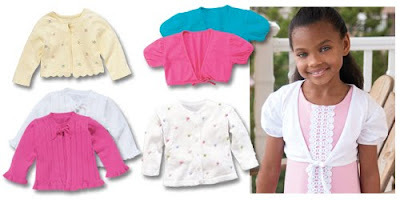 CWDkids offers an array of cardigans and shrugs to top off any dress or outfit! Some are even sold as a set with the dress! Click here to shop our collection of cardigans and shrugs now! 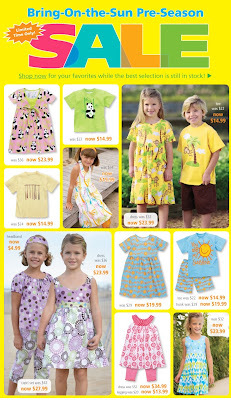 CWDkids has always carried a large selection of merchandise made right here in the USA. 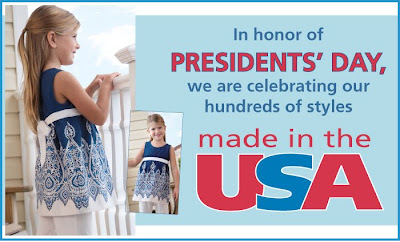 Over the years, many of our customers have told us that it is our Made in the USA line that keeps them coming back! View our entire selection here. 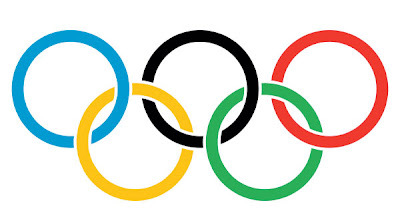 Tracy: I can't wait for the Winter Olympics opening ceremonies! Don't forget to get your kids involved! Watching with your children is the perfect opportunity to teach them about dedication and world culture. Tell them the meaning of the five interlocking rings and encourage them to appreciate how hard the Olympic athletes have worked. Read more about watching the Olympics with your children here. Kara: I loved watching New Orleans Saints quart back Drew Brees celebrate his victory with his one year old son Baylen. You will love reading the whole story in this feel-good post from the New York Times parenting blog. Ashley: How adorable are these cell phone text message valentines?! 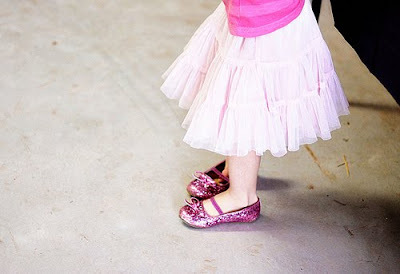 They are so cute, but not too frilly so they are perfect for girls and boys. You can also read more about these sweet texts here at FamilyFun.com. 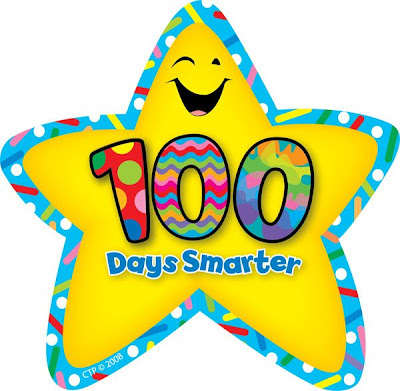 This week, many elementary students across the country are celebrating their 100th day of school. School children all over are bringing in 100 of one small item to school. This helps them visualize 100 items, be it paper clips or marshmallows! The Enchanted Learning website has some terrific ideas for you and your child to work on this week. Can your child be quiet for 100 seconds, what was life like 100 years ago, name 100 animals? I think your children will love celebrating this milestone with you. TODAY ONLY! 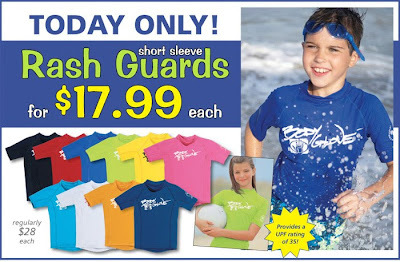 Our best selling Rash Guards are only $17.99 (Reg. $28). Hurry, offer expires tonight! Sunday is Valentine’s Day! I am excited to enjoy the holiday on the weekend. I will have the time to make a very special Valentine's Day brunch. 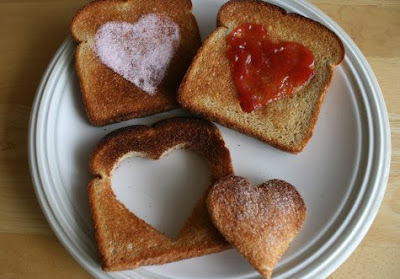 I saw this adorable idea for Valentine toast on the Make and Takes blog. You can make this special toast with jelly or cinnamon sugar. I know this will be a hit at my house. I am also going to prepare heart-shaped pancakes. For lunch, we are having heart-shaped sandwiches along with their favorite... Cherry Coke! I have already purchased these adorable heart pj’s from where else? CWDkids, of course! I know my daughter will LOVE them. How will your family celebrate this Valentine’s Day? 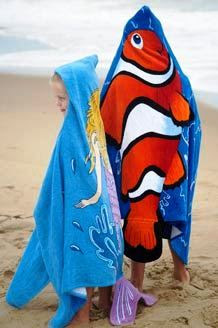 Just when they thought a day at the pool or beach couldn't get any more fun...throw a couple of these adorable hooded towels in your bag! Parents will love that the hoods and hand pockets will keep young swimmers warm and kids will love the bright colors and fun characters. 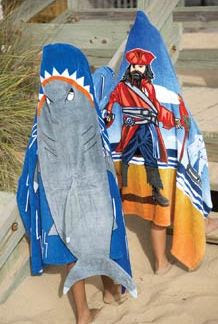 Take a closer look at all of our beach towels, including our beach towel backpack sets here. Richmond, Virginia was blanketed with another eight inches of snow this weekend! 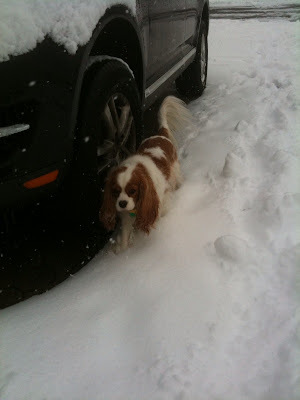 Here is Olivia, our company mascot, enjoying the weather. What happened in your town over the weekend? Kick off your weekend with $5 Shipping on your orders of $25 or more! Just enter code CGTSBL in the coupon code box during checkout. Start Shopping Now! Tracy: Just in case you missed it! 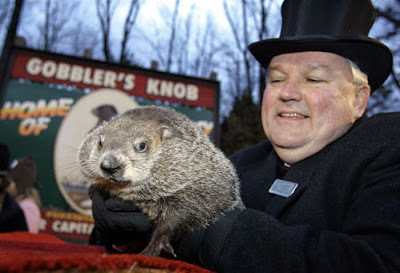 Click here to watch a local news program's coverage of Groundhog Phil's prediction for six more weeks of winter. Darn you Puxatony! Ashley: We have really had a winter here in the sunny South! We just survived a snow store and are battening down the hatches for more this weekend. I need ideas to keep my kids busy. If you do too, click here or here for some great indoors ideas and activities. Kara: Looking for crafts and valentine card ideas for your kids to create? The Crafty Crow and Twist blogs have pulled together for a slew of fun activities which will stir up the family Valentine's fun at your house. Trust me, you won't want to miss the cupid pretzels! Also, don't forget to check out CWDkids Valentine & Hearts collection! My house is starting to hum with excitement....we are getting ready for football’s biggest game of the year, the Super Bowl. My eight year-old-son cannot wait. 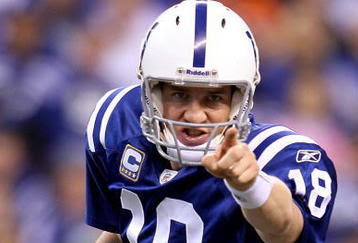 He has picked his team: the Colts, he has his jersey pressed and ready, #18 Peyton Manning, and we are working on our menu. Everyone in my house loves the Super Bowl, not just for the game, but what else, the food! It is an evening for hearty fare and a bit of the unhealthy too! I just found a recipe for pizza bites on Annie’s Eats blog that will be perfect for our evening. I found some fun ideas to keep the children busy during the game on the Suite 101 blog. They will be playing hide and go seek with a football, having a cookie decorating contest, or maybe a cheerleading contest. Saints or Colts? Who are you rooting for this year? Let us know! 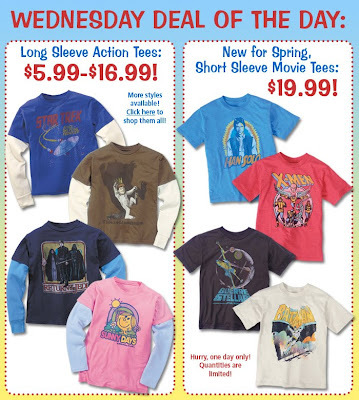 Action Hero and Character Tee Shirts are Wednesday's Deal of the Day! Starting as low as $5.99 TODAY ONLY! Last week, The American Library Association announced their top awards for the year. When You Reach Me by Rebecca Stead won the coveted John Newberry Medal and The Lion and The Mouse by Jerry Pinkney won the Randolph Caldecott Medal. Each year, my children and I love to read the winning books and talk about why they were selected. Sometimes we agree with the American Library Association and sometimes, we don’t. My children’s school library gets the kids excited about this annual award by having the children vote for their favorite picture book of the year. It is wonderful to see kids getting excited about reading! If you want to read more about this year’s winning books for 2010, click here. How cute are these tees? Our customers agree! 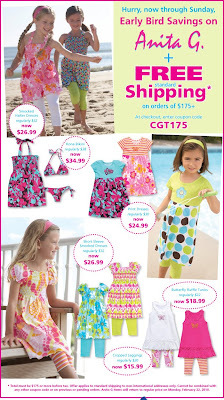 The cheerful colors and sweet designs are perfect for spring and warmer weather. We LOVE that the ruffle applique designs and the quality of the fabric is so substantial. (Click the image above for a closer look, or better yet, use our zoom feature to see the designs up close.) The contrasting lettuce edges make them great to mix and match with our pearl edge skort. Your little sweeties will be pleased, we are sure! Makes a perfect Valentine's Day gift....buy two and save! 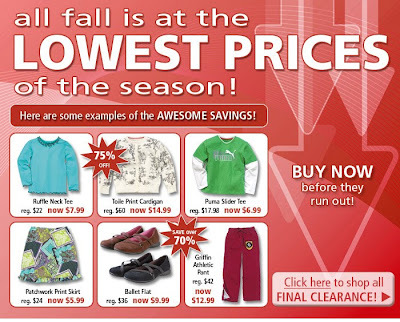 Our Fall & Winter merchandise has just been reduced to the lowest prices all season. Shop our Clearance Sale now! Hurry, quantities are limited!